Cow chip implants are helping USU researchers gather more data from dairy cows. Farmland has decreased by 72 million acres in the last 30 years, according to the U.S. Department of Agriculture. Less farmland and a growing population have farmers turning to technology to produce more with less. 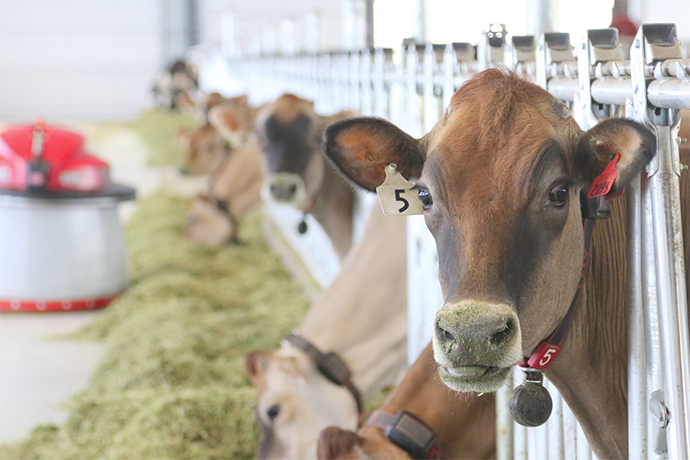 Cow chips are helping Utah State University researchers gather more data from dairy cows. No not that kind of cow chip, a small implant that tracks biometric data. Everything about the cow’s life is measured – things like activity, heart rate and temperature. “The greatest benefit from implanting this type of device is that it collects a little bit more sensitive data than the external wearables that are out there for livestock,” said Kerry Rood, extension veterinarian for USU. Rood said USU is conducting a pilot program. One of his first priorities is to make sure the cow is as comfortable as possible. The better farmers take care of their animals, the more food the animals produce, according to Rood. USU agriculture economics professor Dillon Feuz said technology has the potential to improve the food system from the farmers all the way to the consumers. “As a university, if we put that in then we can also be conducting research and help producers know whether that’s a good decision or not for them to make,” Feuz said.